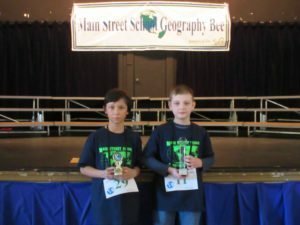 Main Street School held its 10th annual Geography Bee competition on March 6, when a group of 15 fourth-graders and 15 fifth-graders answered questions covering all facets of geography worldwide. Ten rounds concluded with an elimination and championship round and a tiebreaker. The winning title went to fifth-grader, Alex Korb; fifth-grader Nicholas Vinces was named runner-up. “We applaud all of our finalists for participating in this exciting event,” Principal Joyce Chapnick said. Superintendent of Schools Dr. Kristopher Harrison and retired Irvington High School principal, Dr. Scott Mosenthal, moderated. A total of 138 students participated in the qualifying round before the 30 finalists were selected. The event was made possible by support from the PTSA.